This post has nothing to do with food. Or wine. It's about Elli - the budding artist. 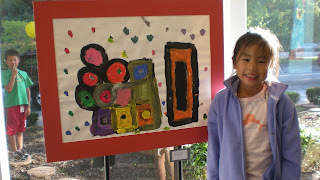 She is one of about 40 elementary kids chosen to be in a Mill Valley School District art and poetry show. We have five elementary schools in Mill Valley - so this is a pretty big honor! Here she is with her masterpiece. This weekend, Elli told us she wants to be nine things when she grows up. Well, she's already a singer, dancer and artist. Better watch out America. Elli's on a mission. You may have your first Chinese-born American running things in 30 years. Wouldn't that be amazing.